PHILADELPHIA – Some 1500 nurses and professional and technical workers struck at Temple University Hospital Wednesday morning after working without a contract for seven months. A spirited crowd of Temple workers and their allies filled Broad Street in front of the north Philadelphia hospital for a noontime rally as the strike gathered strength and support during its first day. The strikers were buoyed by the presence of the national paresident of the Hospital Workers Local 1199c Henry Nicholas and other union leaders who expressed support. 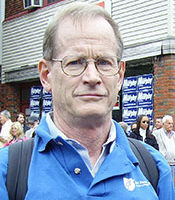 Jim Savage, President of United Steel Workers Local 10-1, said, “The Philadelphia labor movement supports you; we’ll be here. You just have to last one day longer than they do!” Paul Prescott of the Student Labor Action Project (SLAP) told the strikers that Temple students were in support and had delivered a petition with 1300 student signatures saying so to university President Anne Weaver Hart. 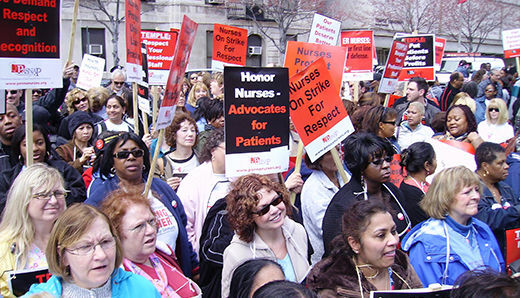 The striking workers are members of the Pennsylvania Association of Staff Nurses and Allied Professional (PASNAP). They include 1000 members of TUHNA and 500 professional and technical employees such as social workers and laboratory workers who are members of Temple Allied Professionals (TAP). The workers say that the Temple administration is taking union busting to new levels in this strike. Their contract expired last September 1 and the administration has refused to bargain since that time. An issue that generated special anger was an attempt to insert in the contract a clause that would legally bar employees from publicly criticizing administration practices at the hospital. Speakers pointed out the irony of management’s attempting to deny workers their Constitutional rights in the city where the Constitution was written. 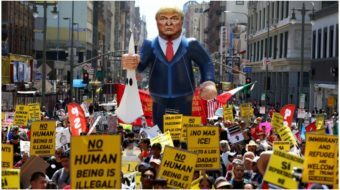 PASNAP President Patricia Eakin told the World that this “gag order” amounted to a “global screw job” that the members would not tolerate. The spirit and determination of the strikers was all the more impressive in light of the protracted management campaign to have its way in this contract. The strike focuses attention on key national issues of labor rights, affordable health care, and privatization. The union notes that Temple has gone into the healthcare business with disastrous results. Thirteen years ago Temple bought an additional healthcare facility, Northeastern Hospital which, for decades, had served the northeast Philadelphia community and was a busy facility until Temple closed it in April of 2009. The University now is putting all its effort into breaking the union at its remaining facility near the north Philadelphia campus. The union says that the University has hired outside firms to bring in 800 strikebreakers who are being paid $10,000 a week and housed at expensive downtown hotels.